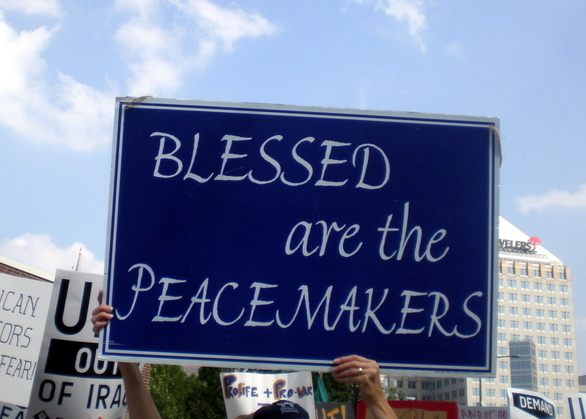 Below is a statement originally issued as a sign-on statement in May 2008 on the 25th anniversary of the U.S. bishops’ peace pastoral, The Challenge of Peace. We’re rep-posting it to mark hat yesterday was the anniversary of the peace pastoral, to call attention to the ongoing need to still address the issues raised in the document. Ten years later, in The Harvest of Justice is Sown in Peace, the bishops further specified that “progressive disarmament” must mean a commitment to the elimination of nuclear weapons, not simply as an ideal, but as a concrete policy goal. It is abundantly clear that the U.S. policy of nuclear deterrence has been institutionalized—been made a “permanent measure,” the very “long-term basis for peace” that the U.S. Catholic Bishops rejected in The Challenge of Peace— and that the United States has no policy goal of eliminating either these immoral weapons or their central role in U.S. national security strategy planning. Rather, the United States has today embarked on a $150 billion reinvestment in its nuclear weapons arsenal dubbed Complex Transformation (formerly known as Complex 2030). The United States is modernizing its nuclear arsenal and modifying existing warheads to achieve new capabilities; retooling its capacity for nuclear weapons research, design and production; enhancing systems necessary to plan and execute nuclear strikes; and has developed a “Global Strike” capability that allows the United States to launch nuclear weapons against any target on earth in less than a few hours. As Catholic Christians and followers of the nonviolent Jesus, we reject this “institutionalization” of nuclear deterrence as nothing less than nuclear terrorism. WE CALL on the Bush Administration to abandon the $150 billion Complex Transformation program as a provocative and unnecessary initiation of a new nuclear arms race and, as such, an unconscionable theft from the poor as articulated by Vatican II. WE CALL on the Catholic Church in the United States to evaluate current U.S. nuclear weapons policy and expenditures in strict accordance with their moral conclusions of 1983 and 1993, and to finally pronounce its rejection of the morality of nuclear deterrence. WE CALL on all Catholics and people of faith to evaluate candidates for President and Congress based on their commitment to change U.S. nuclear weapons policy.